We have trained CT service engineers on staff that are strategically located to respond to CT service problems quickly. When you call, our goal is to get back to you in 15 minutes or less, repairing your equipment and returning it to operational condition the same day. Our dependable, trained and experienced engineers are available to respond 24/7/365. Acceletronics offers an uptime guarantee, ensuring that your equipment is being cared for by a service company with a vested interest in making sure that down-time is kept to a minimum. Scheduled and preventative maintenance is performed around your treatment schedule to maximize clinical availability of your equipment. 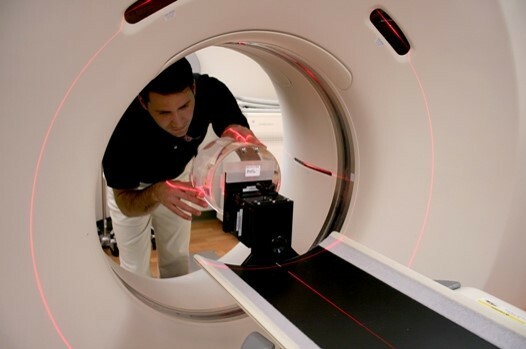 We have strategically located trained and experienced Linac/CT engineers who are available to support your equipment even when your primary engineer is not available. Acceletronics cross trains its engineers so that in many instances, your CT and Linac will be serviced by the same engineer, giving you one reliable point of contact for both Linac and CT service. Acceletronics supports its clients with a large inventory of parts for CTs. We also have multiple purchasing agreements with CT parts vendors, ensuring fast shipping and replacement of defective CT parts. We take pride in saving our customers significant costs while providing high quality service and maintenance. We provide a wide array of service contract options with flexible payment options.